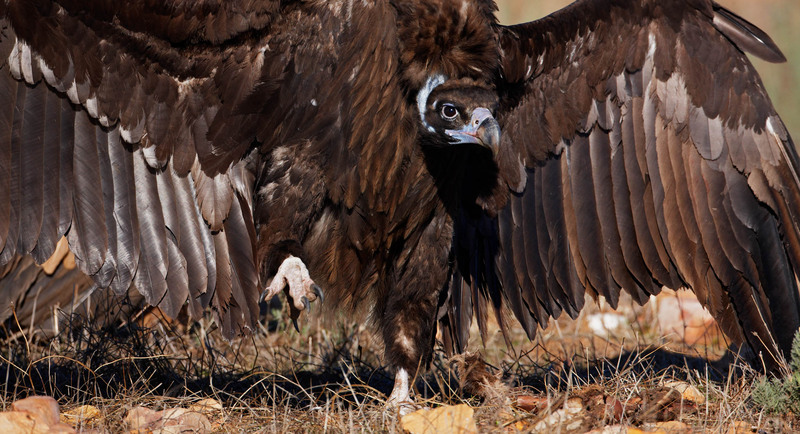 The ongoing construction of artificial nests in the Rhodope Mountains will hopefully soon see the spectacular black vulture breeding once again in Bulgaria. An integral part of the rewilding process is creating the right environmental conditions for wildlife to make a comeback of its own accord. This autumn two more artificial black vulture nests were constructed in the Rhodope Mountains rewilding area in Bulgaria. Black vultures are last thought to have bred in Bulgaria in 1993, and it is hoped that these structures will lead to reestablishment of the birds as a breeding species here. 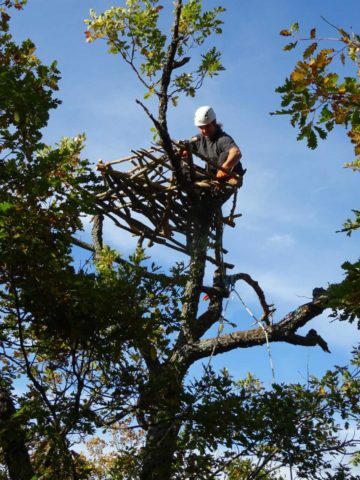 Dobromir Dobrev, a vulture expert attached to the Rewilding Rhodopes team, builds an artificial nest. The locations of the artificial nests were selected according to a complex GIS model and various scientific publications. The base of these impressive structures is typically 1.5 metres in diameter, with a thickness of up to half a metre. The upper part is made from organic materials, such as the branches of trees and green moss, to make the nests as natural and enticing as possible. Since the LIFE Vultures project began in 2016, 12 artificial have been constructed in the rewilding area. The project was developed by Rewilding Europe, in collaboration with the Rewilding Rhodopes Foundation, the Bulgarian Society for the Protection of Birds (BSPB), and a range of other partners. Focusing on the Rhodope Mountains rewilding area in Bulgaria, as well as a section of the Rhodope Mountains in northern Greece, the aim of the project is to support the recovery and further expansion of the black and griffon vulture populations in this part of the Balkans, mainly by improving natural prey availability, and by reducing mortality through factors such as poaching, poisoning and collisons with power lines. Over the next few years, more artificial black vulture nests will be built in species-appropriate habitats in Bulgaria’s Rhodope Mountains. Once widespread in Bulgaria, the last confirmed data on black vultures as a breeding species here dates back 25 years, when a pair nested in the Studen Kladenets region. The only remaining black vulture colony in the Balkans is located in Dadia National Park, which is located in the Greek section of the Rhodope Mountains, about 25 kilometres from the border with Bulgaria. The concentration of birds in one particular area increases the risk of extinction; supporting the establishment of new satellite colonies will hopefully mitigate this risk, and lead to further recolonisation in other parts of the Balkans and beyond.